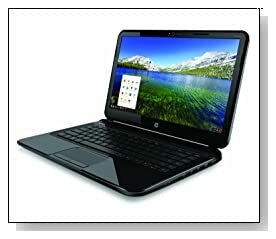 The first full-size 14 inch Chromebook, HP Chromebook 14-c050 is a comfortable, solid, reliable, attractive, efficient and affordable laptop that comes with advantages over Windows machines. Although the technical specs may appear quite modest at first glance, everything runs so smoothly without you having to experience any lags or problems.This may well be your entry into the fun Google world..
1.1 GHz Intel Celeron Processor 847 with 4 GB DDR3L SDRAM and 16 GB Solid-State Drive.. 4GB RAM memory is twice the size of other standard Chromebooks so it will let you work on your tasks more comfortably, running a few things at the same time. 16GB Solid-State Drive may seem small in size but this is not a standard Serial ATA and your system will start fast and everything will run faster on it. You have the cloud based 100GB of Google Drive storage- free for two years anyway. The main advantage is the ability to access all the data on all different devices wherever you are. Thin and light HP True Vision LED backlit HD 14 inch screen with 1366 x 768 pixel resolution is bigger than the 12 inch screens of first generation Chromebooks. So it will be more fun doing your daily tasks, watching movies and playing games on it. This Chromebook being a 14 inch, has a full-size island-style ergonomic and comfortable keyboard that makes it look more like a normal notebook than a netbook, which also lets this HP have more ports than usual: 3 x USB 2.0 ports, 1 x Audio-out Port, HDMI out, Ethernet and an SD card slot, 802.11bgn wireless but no optical drive (which may be the drawback for some users). 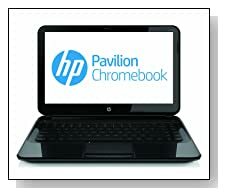 HP Chromebook 14-c050 has a sparkling black colour, weighs under 4lbs and is 0.83 inch thick. Itis Energy Star qualified and gives you well over 4 hours of battery life in your daily use of normal tasks. As a beginner, you fill find the 'Get Started' app a great help in getting used to the web focused Chrome operating system as it will take you through its many features.. Updates run in the background constantly and quietly, without interrupting your work to improve your productivity, unlike the Windows updates. Conclusion: HP Chromebook 14-c050nr offers a great alternative to the systems running Windows 8 operating system- especially for those that dislike the Windows 8. This is a fast and nice looking notebook with modest features that will help you perform your daily tasks easily and efficiently. It feels solid and good quality- should definitely last you quite a few years. Now offered at a discounted price on Amazon too.